Recently my friend asked for help in making her twin sister a gift for her baby shower. 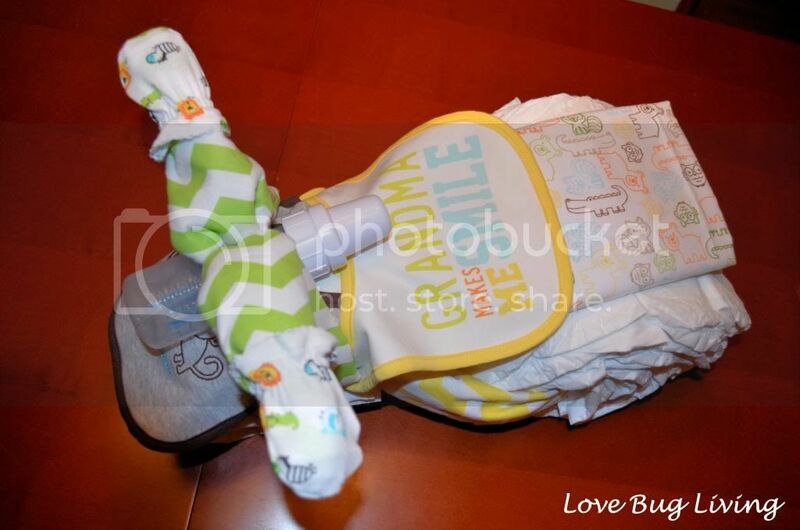 She liked the idea of a diaper cake, but wanted to go the less traditional route. 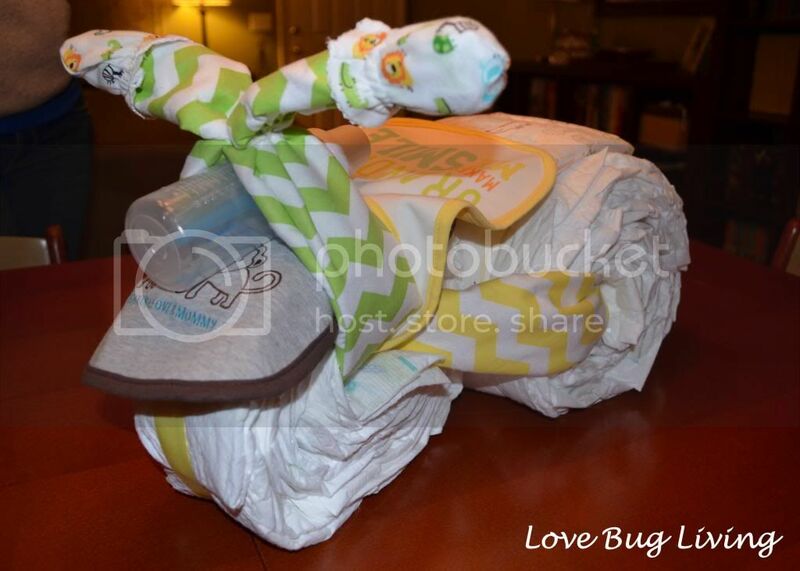 We both liked the Diaper Tricycles we had seen on Pinterest and thought they would be fun to make. After searching all the links, we could not find an actual tutorial on how to make one. So...I thought I'd share what we came up with. 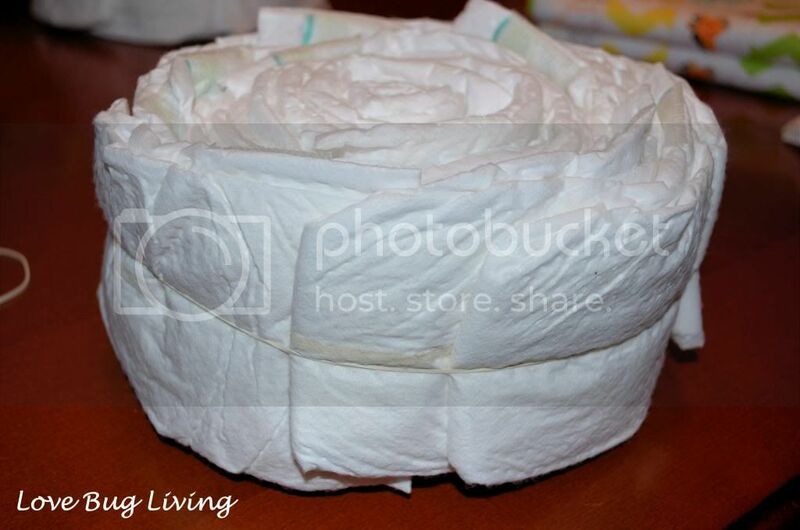 You will start with a large pack of newborn or size 1 diapers. You could actually make a two or three wheel bike. We decided to go with the three wheel trike. 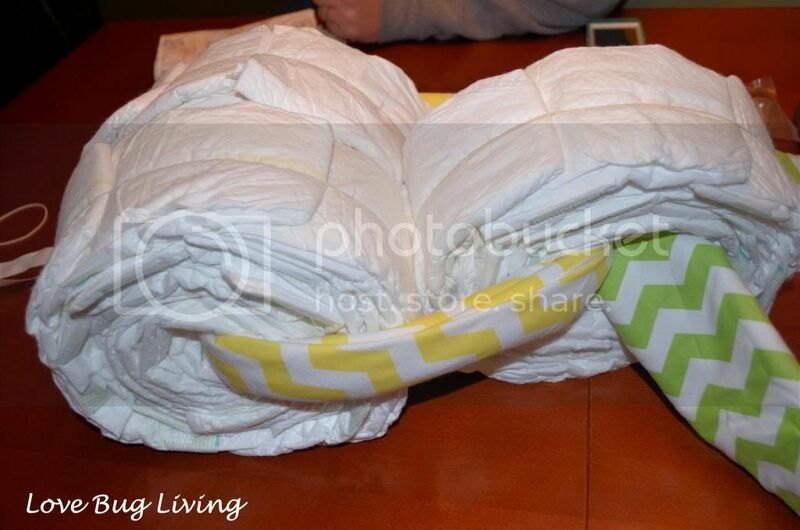 Whichever you decide, divide your diapers evenly. Start by rolling a diaper up. Keep adding diapers, rolling them up around each other until you use them up. Wrap a large rubber band around the wheel to keep it together. Do the same with the rest of your wheels. Now it's time to put your wheels together. You will need two swaddling blankets. The first one I folded on the diagonal to make it a bit longer. Keep folding it over until it is a long strip about 2-3 inches wide. Thread the blanket through the middle of your front wheel. Take each end and thread them through the other two wheels. After threading the two ends through the back two wheels, tie the ends together. The knot should be between the two back tires, so it will be hidden. Fold your second blanket in half again and again until it is about 3-4 inches wide. Thread it through your front wheel as well. Pull the ends of that blanket up and use a rubber band to keep the two ends together. You can slide a baby bottle under the rubber banded section to serve as a headlight. Slip a baby mitten or sock on the ends of the blanket to become the bike's handles. Now it's time to add your fenders and bike seat. We used a baby bib in the front as a fender, a baby bib over the back as the bike seat, and another swaddling blanket under the bib as the back fender. We added a bit of ribbon around the wheels to cover the rubber bands and to give it a bit of color. 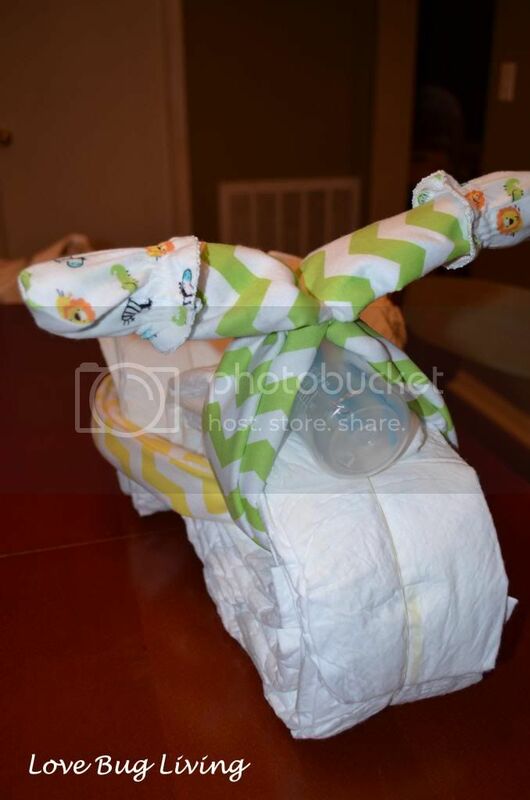 Your diaper trike is ready to ride! Just add a fun loving stuffed animal on the bike and he's ready to race! 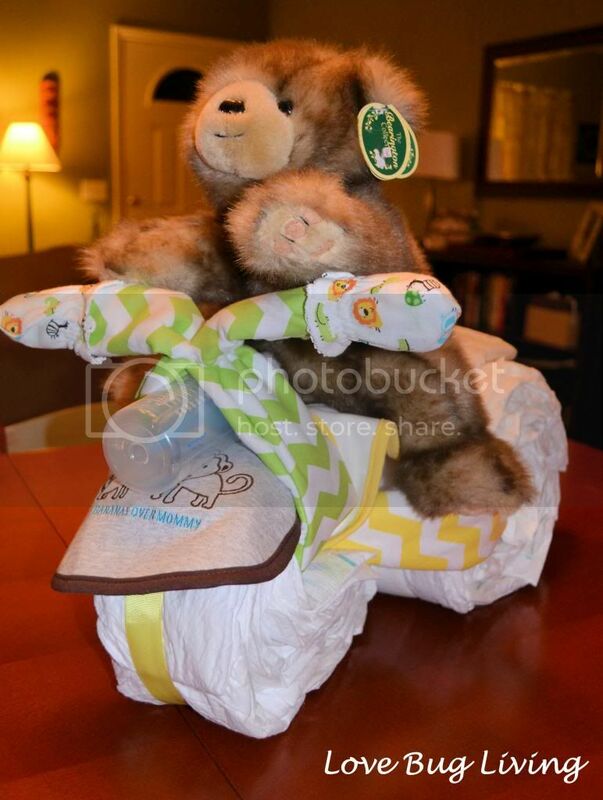 This diaper cake tricycle is a fun gift for the Mom to Be or a great centerpiece for any baby shower. It turned out to be pretty quick and easy to make as well.